It is with pleasure and at the will of D0ll Nation presents... Brunch with a Goddess that I pass to you this communication. In this podcast I explain the task of improving self beyond the design. If you agree with this content do assist in destroying what waits within the laylines. Welcome back sister Shelly and congratulations to you again. No one on the corner baby!!! Giving thanks to all ships in passing that joined this podcast today and those that will hear this message. 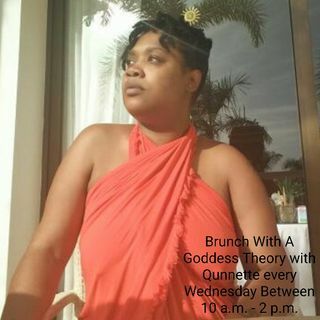 Join me next time for more breaking of the bread here in the Garden of milk and honey and for more brunch with a goddess. Have a great rest of the day. Welcome back Ma! Happy working women Wednesday, tell Granny haaaaaay lol. Peace and love sun thanks for helping your Gmas out with the show lol ur the best. Love y'all. Hey hey Mystics welcome back to the garden... I cant wait to share the elixer of how to deal with what waits in the laylines along our journies. Also I im sharing my own DIY beauty elixer I made using rose buds and another using Tumeric for soft feeling and blimish free skin. Like share and tag a ship in common if you like this content. Welcome back to the garden and happy working women Wednesday to all ships in passing. I've been waiting for you, please come on board there's plenty of room.